Shortbread Crust is the perfect addition to your spring menu! Happy first day of spring my friends! I'm really excited that spring is here, but also baffled at how quickly it came. It seems like we just started a new year, and here we are already in a new season. I mean, I'm not complaining. Even though we had a very mild winter I'm happy to put it behind me and move on. But it just seems like the older I get, the faster time goes. Anyone else feel that way? My "baby" has just two short months of high school left before he graduates, and my oldest has just a few weeks left of classes before he finishes his junior year in college. I honestly don't know where these years have went! OK, let me change the subject before I get all sappy and start crying over here. Let's talk about food, because food always makes me happy. Specifically dessert. 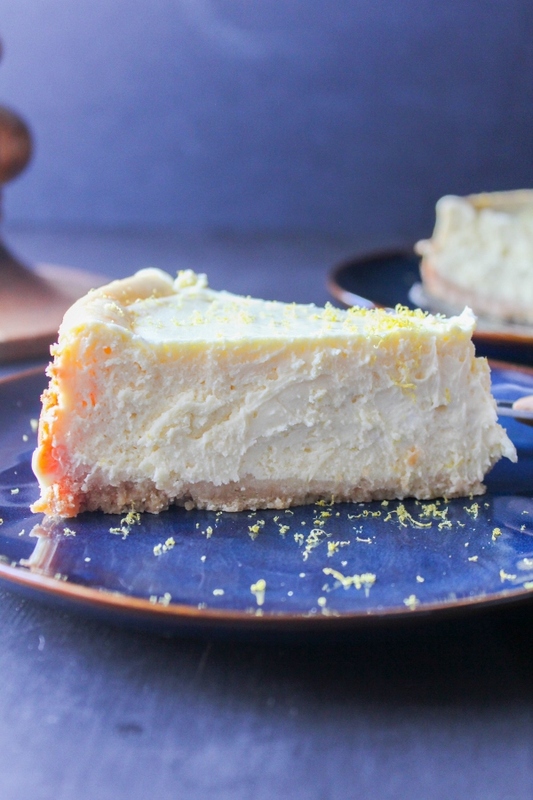 Even more specifically, this Lemon Cheesecake with Shortbread Crust. This cheesecake makes me very, very happy. 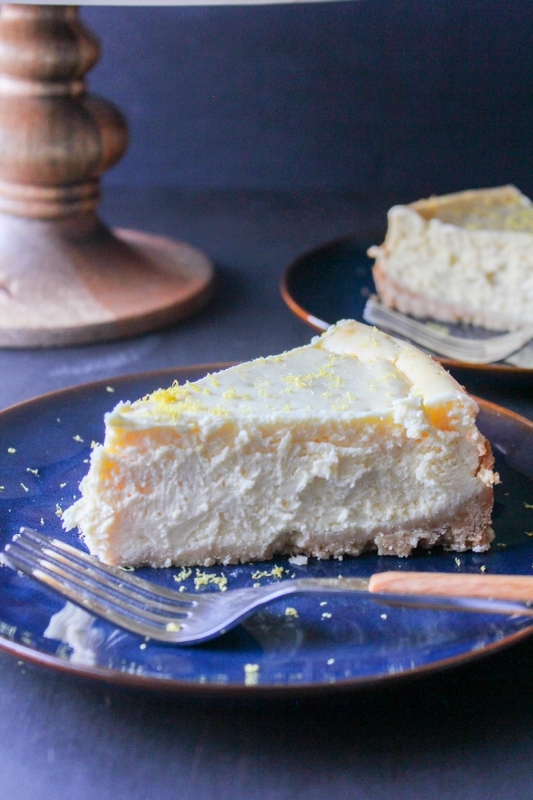 It's light and creamy, it's super citrusy, and it's just downright delicious. See, I'm feeling better already! 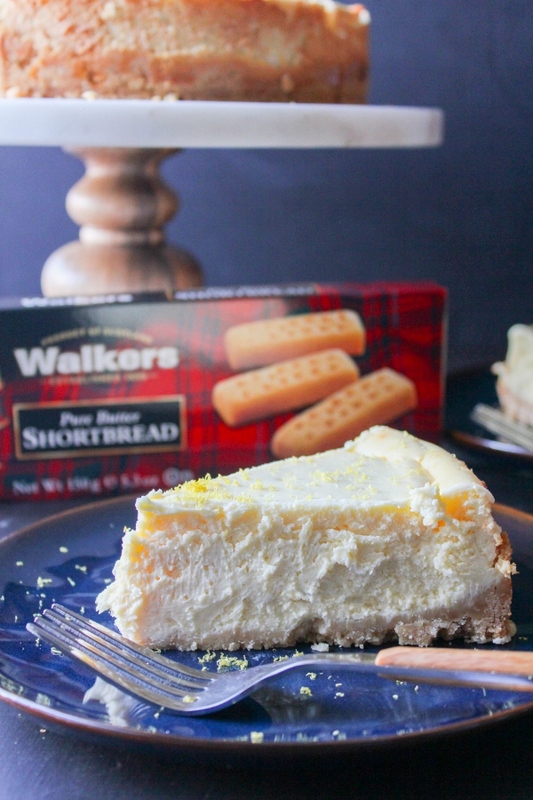 The crust of this mouthwatering cheesecake is made with Walkers Pure Butter Shortbread cookies, so right there we are starting with something real good. On their own, these cookies literally melt in your mouth. And let me tell you, they really rock as the base of this cheesecake. The filling is made with both fresh lemon zest and juice, plus lemon extract, which gives it so much amazing lemon flavor. 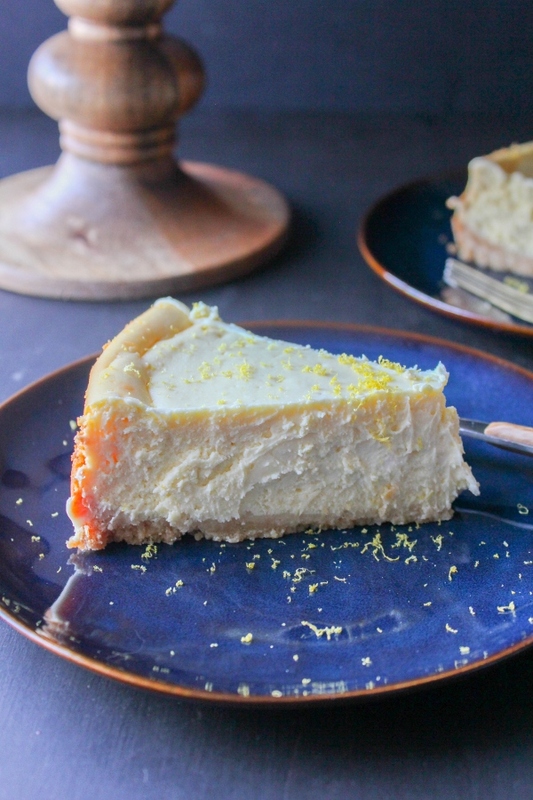 I feel like eating all things citrus is the perfect way to kick off spring, don't you agree? Let's welcome spring with open arms by celebrating with cheesecake! And let's hope the rest of this year slows down, just a little bit at least. Preheat the oven to 325 degrees. In a small bowl, mix together the shortbread crumbs and butter. Press onto the bottom and up the sides of a greased 10-inch springform pan. Place the pan on a baking sheet and bake for 10 minutes. Set the pan aside on a wire rack to cool slightly while preparing the filling. 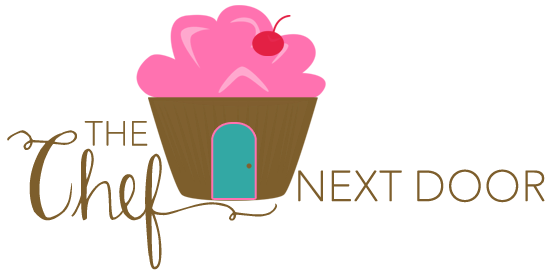 In the bowl of a stand mixer, beat the cream cheese and sugar until smooth. Add in the cream, lemon juice, flour, lemon zest, and extracts and mix well. Add the eggs all at once and beat on low speed until combined. Pour the filling into the crust and place the pan back on the baking sheet. Bake the cheesecake for 50-60 minutes, or until the center is almost set. Cool on a wire rack for 10 minutes, then gently run a knife around the edge of the pan to loosen the cheesecake. Continue to cool completely, then refrigerate overnight. Remove the sides of pan, slice and serve.